Historic England’s Heritage at Risk Register 2017 has been recently published, providing the annual snapshot of the state of England’s most valued vulnerable historic places. The Register brings attention to the sites across England that are at risk of being lost as a result of neglect, decay or inappropriate development. Duncan Wilson, Chief Executive of Historic England, said: “The Heritage at Risk Register is an annual health-check of the country’s most special and vulnerable historic places. We can celebrate the fact that 387 historic sites have been saved this year across England by organisations and communities working with Historic England and want to thank all those who have cared for at-risk places, bringing them back into life and into use. From the volunteer bracken-bashers at prehistoric sites to the apprentices learning and applying traditional craft-skills to medieval buildings, this is a huge, collective labour of love and it is well worth it. The Cooperage is the most complete timber-framed building from the late medieval period in the city. The Cooperage is Grade II* listed and is one of the most prominent buildings on the quayside, having escaped the great quayside fire of 1854. Built in the first half of the16th century as a merchant’s house it was later converted for commercial use including a grocers, coopers, restaurant and public house. It was a popular bar but since its closure in 2005 it has fallen into disrepair due to neglect and a lack of regular maintenance. On a quayside that is once again a vibrant commercial district of Newcastle, a new use needs to be found for the Cooperage if it is to survive. 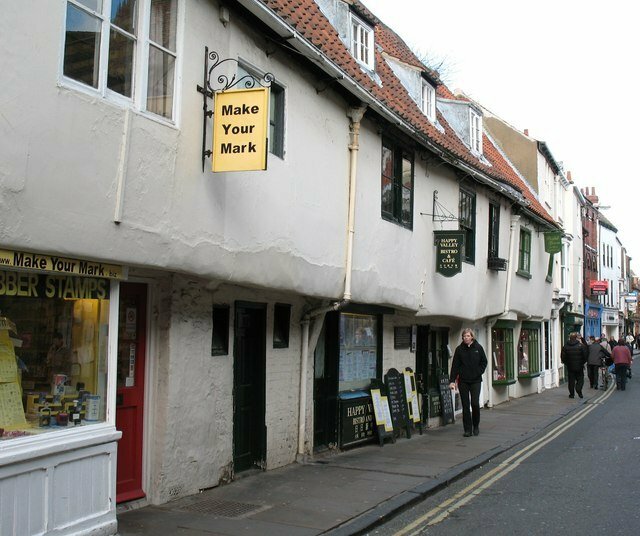 Lady Row is Grade I listed and dates from c1316 and is probably the oldest complete timber framed building in York. It now consists of a ten bay timber-framed row, No.72, the west-most bay, was hit by a lorry in 2016. As well as the impact damage, the timber-framing is extensively decayed. This property at the end of the group has been scaffolded and cordoned off ever since. Historic England has offered specialist assistance to City of York Council to secure appropriate repairs, and work is due to start soon. The ruins of Penyard Castle, a 14th century Marcher Castle, are set in Penyard Park to the south east of Ross on Wye, Herefordshire. The castle was partly rebuilt as a farmhouse in the 17th century but this building had got into a ruinous state also. It has been on the Heritage at Risk Register since 1998 but now the vegetation that was damaging the structure has been removed and the site has been stabilised and repointed thanks to a grant from Historic England. This means the site is being taken off the Register this year. Over the past year, a total of 387 entries have been rescued and removed from the Heritage at Risk Register – at least one site per day across the country and 328 were added making the total number on the Register 5,290. Historic England has also met its target to reduce the number of sites on the 2015 Register by 15% (746 sites) in 2017 a year ahead of schedule. The Heritage at Risk Register 2017 reveals that in England, 1257 Grade I and II* buildings, 2480 scheduled monuments, 937 places of worship, 96 registered parks and gardens, 4 battlefields, 4 protected wrecks and 512 conservation areas are at risk of neglect, decay or inappropriate change. There are 5,290 assets on the Heritage at Risk Register, 97 fewer than in 2016. Many of the Heritage at Risk findings reflect the efforts to conserve medieval sites.